Tsukuba`s Sengen (千現) District is not only a conveniently located upscale residential neighborhood (within easy reach of both the TX rail and JR Highway Bus Stations), but it is also home to an internationally renowned research institute (NIMS) and a major facility for Japan`s Space Agency, JAXSA ( I should also mention the presence of the tastefully appointed flower shop- Blomster Anna ). Thus, I guess it could be said that this makes SENGEN one of the more prestigious and sought after addresses in Tsukuba City. The other day, while walking through that part of town, I made a fascinating discovery which revealed how EVEN IN PAST AGES , when the area that is now called SENGEN was still mostly MARSHLAND, it had been a coveted piece of real estate which was vied for, and fought over by local residents, who at that time (The Edo Period 1600-1868) happened to belong to different clans . I got to know this , and plenty of other fascinating things as well, by stumbling upon a wooded mound, which I learned had been dubbed – Tsukuba`s Mt. 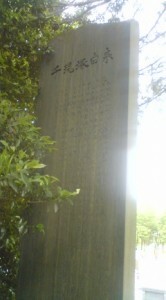 Fuji- atop of which stands a large slab upon which its tale has been inscribed. Before telling you the details of the history I found etched into the stone, let me first explain how I stumbled upon it, because some of the scenery I found along the route which brought me there bears great significance ( I realized later) to the tale which I will tell. On a beautiful early summer day, I was in the Ninomiya neighborhood of Tsukuba, and had a couple of hours to spare before an appointment a few Kilometers away in Takezono (another of Tsukuba`s neighborhoods). Instead of taking the bus, as I would have done if I had been more pressed for time, I decided to stroll around Doho Park and try to catch a glimpse of some of the kingfishers ( kawasemi) which can often be seen on the western edge of the park`s pond, and then walk to Takezono. The pond at Doho Park , still thick with reeds and other marsh vegetation on its eastern edge, is a remnant of an extensive system of marshes and woods which once existed in the area upon which The Tsukuba Science City was eventually built. These marshlands ran pretty much on a North-South axis, with the Oto-Numa Marsh (which still exists) demarcating its southern limit, and the grounds of what is now KEK (The High Energy Physics Laboratory), which had once been a big marsh, near the systems northern edge. We can still find reed filled ponds within the precincts of The Space Center, Sanso-Ken ( NIAS), The Meteorological Research Institiute, Matsumi Park, Tsukuba University, etc., and these are all aligned along the same axis (now sandwiched between Nishi-Odori and Higashi-Odori, major boulevards which run paralel to each other), and they are a testament to what Central Tsukuba was like in past ages. I walked around the Doho Park pond and then headed off towards Takezono. I passed through the Sengen neighborhood, dropped in at the flower shop, and then crossed Higashi-Odori (at the interesection near the Chin-Rai Ramen Shop) and entered into the Kurakake section of Tsukuba City, which has until now been relatively free of modern development. 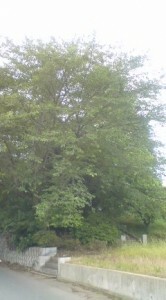 After 50 meters or so down the road, just passed a graveyard, there was a little hill, crowned by a big, old cherry tree. If I had been in a car or on bicycle, I probably would have just kept going (as I had, many time before on this road) and not found anything. 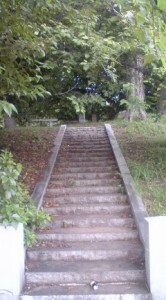 But as I was on foot, I noticed a staircase, just barely visible from the road, which led up the hill. I then proceeded to skamper up the 23 steps to the top. There, the land had been flattened out creating a tiny hilltop plateau. Directly in front of me, in the shadow of the big cherry tree, stood two low, squat, stone monuments, one of quite recent make, and the other, so old that it had been severely mis-shapen after years (centuries?) of exposure to the elements. On the newer stone, inscribed with perfect clarity, were the characters reading: FUJISAN (MT. Fuji). A careful examination of the older stone, also revealed, (after finding the angle at which the light hit the stones surface in just the right way), the same characters. In the year 1690, there was a land dispute between two villages. 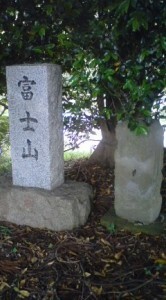 One was Onozaki, part of the Yatabe Clan`s holdings (lying to the west of the marshlands) and the other was Kurakake, then part of the the Tsuchiura Clan`s Territory. Each village claimed the marshland as its own. 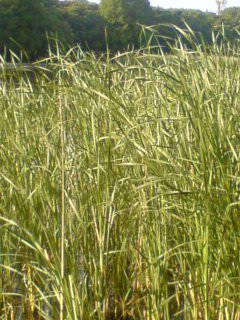 At that time the resources of the marshes, reeds, thatch and other grasses were of great value for the villagers for use as roofing, and animal fodder, and also for making various objects for everyday life. The two villages took the dispute to court. In an effort to ensure victory in the suit, certain Kurakake villagers travelled to the foot of Mt Fuji, to the Sengen Shrine (浅間神社) to appeal for intervention. In 1697 the Shogunate`s officials made a decision in favor of Kurakake. In thanks to the God for helping to make the vilagers prayers come true, a mound was constructed which offered a view of Mt. Fuji, and the Goddess of the Sengen Jinja was enshrined there. Thereafter it become a focus of worship for the people. Erected 1979. Now this story is interesting at many levels. First, The Japanese now pride themselves on having a society with very few lawyers, and in which LITIGATION is unusual. It is surprising to find that more than 300 years ago, traditional hamlets in this area resorted to lengthy( 7 years), and probably very expensive legal maneuvering (just think of the cost in bribes alone!). Then there is the matter of Mt. Fuji Worship, a religious sect (FUJI-SHINKO) which actually came into being in Nagasaki (quite a distance from the mountain itself !) between the years 1532 and 1553) . This sect focused on pilgrimages to Mt Fuji and asceticisms in the caves and lava tubes around the mountain. During the Edo Period (1600-1868), the popularity of this sect spread among the people (especially in and around the capital, Edo). To this day when climbing mt Fuji, you might come across devotees of the sect, clad in wera pilgrim-wear , while walking keep up a continuous chant of ROKKON SHOJO ROKKON SHOJO. The little Fuji Mound in Tsukuba, was a place where people could not actually make it to the REAL MOUNTAIN could make a SYMBOLIC visit. It also intersting to note that there is a big cherry tree on the Fuji Mound. This is not the work of chance. You see, the Goddess of Mt Fuji, KONOHANA SAKKUYA HIME. is also the Goddess of Cherry Blossoms in Full Bloom ( and by extension, the Goddess of Mortality, as cherry blossoms quickly fade away after blooming). This Goddess is also appealed to for families who want children, and for pregnant women`s easy delivery. The reason for this is that according to japanese mythology, KONOHANA SAKKUYA HIME was inpregnated after spending just one night with her huband, NINIGI NO MIKOTO, who became extemely suspicious. Thinking that the child must be from another man (or God, should I say), NINIGI set fire to the hut is which his wife was giving birth. Miraculously, mother and child were unscathed. This naturally makes theisGoddess an obvious choice as a deity to appeal to for conception or easy delivery. Then we have the matter of the place name SENGEN. It was only natural for the villagers, as a way of expressing their appreciation, to name the piece of land that they had won in the suit after the God which had give them that little extra edge. Now the characters used for this neighborhood have changed to 千現, so unless one knows the obscure bit of history inscribed on the slab, it would not be possible to guess at the origin of the place name. Also, the characters for the SENGEN SHRINE (　浅間神社), are often misread even by Japanese, as ASAMA JINJA. Thus, few people who read the slab would make the connection between the story of the mound and the name of the neighborhood which lies just across the road. And if you are thinking about climbing the real Mt Fuji this summer, but are PUT OFF by all the effort and SUFFERING that this would involve, you might want to consider conquering Tsukuba`s little Mt Fuji instead. You can do it in just 23 easy steps!